Using Local Copy Shops Will Save You Time and Toner! When making your own invitations the local copy shops have proven to be a very useful place to visit time and time again. Not only do I make often use of them while working on projects for my clients and this website, but I have also spent quite a lengthy amount of time working at them as well. If I were to give any advice in choosing a copy shop to do business with I would recommend a local mom & pop shop rather than the larger corporate chain store kind of shops. At a family run or small business the services tend to be a lot more personalized. Not to mention that the clerks will tend to be a lot more helpful, and will most likely be able to lend you a few tips and some advice towards your cause. Copying! (of course). Save your ink jet or toner in your home printer. 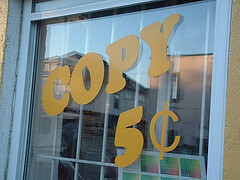 I'd bet that it is more expensive to buy more for your printer than to splurge on a few xerox copies. And the quality of these copies when done by professionals is much better than you would think. No one would know the difference! Choosing to have your invitations xerox copied is especially useful if the event you are hosting is a large one. This will save you a lot of precious time and make the job of assembling the invitations a whole lot easier. Color Copying. These are a bit more expensive, but can come in handy for sure! They are especially handy if you want to add photos to your invitations. Just have your original photo copied several times to one page and cut them out. Most color copiers have a feature that allows you to resize and duplicate a picture onto one sheet many times. Or just have the entire invite color copied with your photo attached. You can have your text copied to the inside on a regular black and white copier. Cutting. Most copy shops have a hydraulic cutting machine designed to cut large quantities of paper all at once. If you are making 2-up (two to a page) or postcard invitations, or just need your paper cut to a specific size this is a very handy service. Having your paper cut for you is usually inexpensive to boot, and only takes a couple minutes. You will be guaranteed a perfect clean cut every time, which is huge. And the task of hand cutting scores of invites and paper all by hand is super tedious. Scoring and Folding. 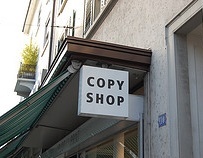 Many copy shops have machines to perform both of these services. Again useful if you have a very large quantity of invitations and don't want to spend forever doing this by hand.